You will discover the techniques to make different sauces, the finishing touch of your dishes. Many French dishes are made from, or accompanied by, a variety of sauces or jus. Examples include beurre blanc, béarnaise sauce and red wine sauce. They add, or accentuate, flavour or bring the flavours of the different elements of a dish together. Jus and sauces are, without a shadow of a doubt, an indispensable part of French gastronomy! This is why Le Cordon Bleu Paris The Art of Making Jus and Sauces Workshop is available several times a month in its new building with semi-professional kitchen equipment. In a relaxed and friendly atmosphere, a small group is guided by a Chef Instructor as they learn to master these delicious, traditional and innovative accompaniments. 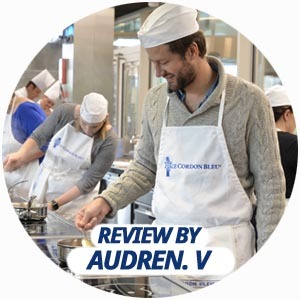 You will cover every detail of the preparation of the jus and sauces selected by Le Cordon Bleu Chef. And, to delight your taste buds, a tasting will take place at the end of the six hour session. Tastings are conducted once all the sauces have been prepared. The Chefs who run the Art of Making Jus and Sauces Workshops are experienced and dynamic. A number of them have worked in Michelin-starred restaurants. The beurre blanc recipe was invented by Clémence Lefeuvre in 1860. It is made from butter, vinegar, white wine and shallots. Proportions vary depending on the individual taste of the cuisine Chef.